Although the violent crime rate in North Carolina is five percent below the national average, a large selection of local employment opportunities are available for students who earn a degree in criminal justice. A criminal justice degree is applicable to several fields of state-funded employment, including local policing, wildlife protection services, and corrections. In addition, students may also go on to achieve private employment in security or as a detective. 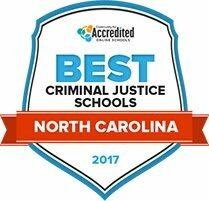 Continue reading below to learn about available schools and academic programs that will be best fitted for students interested in pursuing a criminal justice-based career in North Carolina. A quality program in criminal justice will teach students the field-specific information while providing hands-on experience. Comparing North Carolina’s best criminal justice schools allows students to develop a sense of what qualities are desirable in a criminal justice program. In the ranking list below, students will be able to find institutions with reasonable tuition costs, low student-teacher ratios, and high graduation rates, helping them to find the program that best fits their needs. Explore North Caorlina's top criminal justice schools and programs for 2017 below. Rockingham Community College is situated on the largest campus in the North Carolina Community College system, with more than 260 acres and six walking trails. Rockingham students each year choose from 70 degrees (associate in applied science) or certificate and diploma programs. The community college also offers three college transfer degrees and four baccalaureate degrees offered in conjunction with Winston-Salem State University and Greensboro College. Criminal justice majors can complete an AAS degree in two years or one-year criminal justice certificates. CJ technology courses focus on financial crime and computer fraud. Coastal Carolina Community College was founded in 1972. Through its articulation agreement with University of North Carolina Wilmington, associate degree graduates with a cumulative B average are admitted as juniors In UNCW bachelor degree programs. More than 50 transfer courses are offered through a military partnership with Marine Corps Base Camp Lejeune and Marine Corps Air Station New River. Criminal justice students can enroll in a two-year, 76-credit AAS degree program in CJ technology. Students interested in preparing for entry level law enforcement jobs can enroll in CCCC's 19-credit Basic Law Enforcement Training (BLET) program. Wayne Community College was founded in 1960 as a member of 58 community and technical colleges in the Tar Heel State. Today, WCC's 3,363 full time students pursue associate degrees, diplomas and undergraduate career certificates. The associate of applied science in criminal justice technology is a two-year, 70-credit program that can be completed online or on campus at WCC. Students learn theoretical and hands-on skills in processing crime scene evidence and conducting witness interviews. Electives include studies in terrorism, abnormal psychology, and incident management. CJ students may also choose a one-year, 16-credit undergraduate certificate in latent evidence technology. Forsyth Technical Community College was founded in 1960 as the Winston-Salem/Forsyth County Industrial Education Center, joining the North Carolina Department of Community Colleges in 1963. It currently serves some 12,000 undergraduates, who can enroll in one of the 69 associate in applied science degree programs, 36 diploma programs or more than 80 certificate programs. The undergraduate AAS degree program in criminal justice technology requires completion of 64 hours, plus a 16-week spring internship with a local law enforcement/criminal justice organization. There is also an 18-credit undergraduate CJ certificate program at the community college. Southwestern Community College was established in 1964 to serve the residents of Macon, Jackson, and Swain counties. In 2009, enrollment surged with the opening of the Jerry Sutton Public Safety Training Complex in Macon to host programs in law enforcement, EMS, and fire/rescue. The state-accredited North Carolina Basic Law Enforcement Training program is offered in 36 instruction blocks. The college also hosts the North Carolina Detention Officer Certification Course (DOCC), preparing candidates for detention certifications in entry level positions. Students can also enroll in and complete 16 hours of required in-service training for detention officers. A thorough and holistic examination of law enforcement is at the heart of Pfeiffer University's criminal justice program. Degree requirements include coursework in specific topics from the field such as forensic evidence and constitutional law, as well as training in ethics, psychology and race and ethnic relations. The Ray Harrington Criminal Justice Club provides interested students with an opportunity to meet criminal justice professionals and participate in demonstrations and mock scenarios. Graduates can go on to work in law enforcement, corrections, forensic science and private security, among other fields. Ultimately, Pfeiffer University aims to instill leadership, communication and critical thinking skills in all graduates. The Department of Criminal Justice at East Carolina University explores all angles of preventing crime and improving public safety both in the U.S. and internationally. Through the program curriculum, students will explore institutions from the police to correctional and juvenile systems to sociological issues. Students are also expected to arrange a field education for hands-on learning with agencies and organizations in the field of criminal justice. This program's graduates are employed by diverse institutions including police and sheriff departments, the Department of Homeland Security, the FBI and the Secret Service. East Carolina University also offers a Master of Science degree and two minors (criminal justice and forensic science). NCCU's criminal justice program provides a comprehensive exploration of the adult and juvenile justice systems, how they function and their historical foundations. The coursework trains students to analyze criminal justice systems and problems, apply ethical principles to criminal justice issues and examine crime's impact on policies and practices. Students can also gain real-world experience with a practicum placement in institutions such as police department's, youth homes and district attorneys' offices. Graduates can seek work in a range of criminal justice careers or continue their studies in a graduate program or law school. This program can also serve as continuing education for students already working in the criminal justice field. This program aims to teach not only the state of the existing criminal justice system, but also how it can be improved. Coursework examines prisons and society, treatment of crime victims and sustainable justice among many other topics. Students with an eligible GPA can complete an internship for real-world criminal justice experience. Ultimately, Fayetteville State University's criminal justice degree is designed to produce graduates who are skilled in critical thinking and ethical decision making, as well as versed in the technology of the field. Distance students can also take advantage of an online degree completion program offered in collaboration with North Carolina Community College. At Greensboro College, students can major in criminal justice through the sociology department. As such, students gain a perspective of society as a product of human development that can undergo change. Students have access to resources like internships, community service opportunities and research projects. Also, students who major in criminal justice will be prepared to enter the criminal justice system for work upon graduation, whether at the local, state or federal level. The program teaches students about the criminal justice system, law, research methods, diversity, theoretical thought and trends in the criminal justice field. By utilizing the search tool found below, students will be able to find the criminal justice program that is in line with their interests. Data available includes program costs, student population, and acceptance rates. Students will also be able to compare the variety of programs and emphases available at each school. Whether students are interested in becoming a patrol officer or a forensic scientist, North Carolina’s criminal justice programs may help students to achieve their career goals. The table below lays out a selection of career paths typically available to students who graduate with a criminal justice degree. This table will also allow students to compare employment rates and average salaries of criminal justice employees in North Carolina. By looking at the table below, students may compare the average salary of a criminal justice employee living in North Carolina with the national salary average. Students will also be able to compare rates of job growth projected to develop between now and 2024, both on North Carolina’s local level and on the national level. One of the first steps of finding the right criminal justice career is finding who is hiring graduates with a criminal justice degree. The following table looks at the major industries that are hiring criminal justice graduates in North Carolina and analyzes them in terms of the number of employees being hired, the North Carolina cities that exhibit a need for these employees, and the annual wage these workers earn. Michael G. Turner, PhD is Chair and Professor of the Department of Criminal Justice and Criminology at UNC Charlotte. He earned his Ph.D. from the University of Cincinnati. His research is centered on understanding the causes of delinquency and crime over the life course. What should prospective criminal justice students look for in a school? AStudents should seek out a school where they feel comfortable. There is not much difference between curricula from school to school. So, find a school where they are comfortable with the environment. I think what makes any program unique is what the faculty bring to the table in terms of their research expertise. Our faculty have expertise in delinquency, theory, law enforcement, courts, corrections, etc. In addition, our curriculum has a specialty concentration area in Crime Analytics, which is basically using data to answer researchable questions in criminal justice and criminology. How can criminal justice programs prepare students specifically to work in North Carolina? AI don’t think schools prepare student to specifically work in North Carolina. Rather, schools prepare students to work wherever they may live. If there are readers who are not sure whether or not criminal justice is the right degree for them, what would you tell them? AI would tell them to take a course or two and identify if they enjoy the material and can foresee working in the criminal justice system. What makes someone a good candidate for a criminal justice career? AGood candidates are those individuals who want to work with people and to make a difference in the lives of those people. This division of the state department of labor conducts business inspections and ensures that businesses comply with state regulations. Information for businesses and corporations about North Carolina regulations and taxes, as well as scheme alerts and forms. There is also information about online services that the state provides. Links to tax forms for individuals and businesses in North Carolina, along with online service information. This chapter of the ACC services 450+ members in eastern North Carolina, including Raleigh, Durham, Chapel Hill and surrounding areas. The North Carolina Chamber provides business advocacy services for business owners on issues that include education, talent supply, infrastructure, growth leadership, entrepreneurship and innovation. The SBA provides resources and connections to financing for small business owners in the U.S. This page provides North Carolina-specific information. The EDPNC offers free small business support to business owners and entrepreneurs in North Carolina. Information on staff employment, development, and training for correctional facilities in North Carolina. North Carolina has one of 122 federal security prisons nation-wide. The Federal Bureau of Prisons seeks to provide more progressive and humane care for federal inmates, professionalize correctional facility employees, and ensure consistent and centralized prison administration. This North Carolina branch of the national nonprofit works with criminals reentering society as well as people with mental illnesses who are involved in the justice system. They work to reduce spending in correctional facilities, investing instead in strategies that decrease crime and strengthen communities. The NCPPA is a membership-based group that connects officers from around the state to network and share knowledge and training. The organization advocates for such issues as ending the death penalty, raising the juvenile age and reducing the use of prisons and jails. Information on North Carolina’s courts and potential careers in this field. There is also a link to current judicial branch employment needs within the state. A links page to information on North Carolina’s court system, including various courts and facilities and a portal to employment opportunities. Links to appellate and bankruptcy courts; North Carolina’s district, state, and local courts; laws and regulations; lawyer resources; state agencies; and various departments that may assist with legal education opportunities or other judicial system information within Idaho. Provides continuing education resources to court reporters throughout the state of North Carolina. A nonpartisan organization of legal professionals who aim to protect individual rights in North Carolina. Learn more about how to become a Guardian ad Litem advocate for abused and neglected children. A statewide alliance of advocacy groups and individuals who aim to help people with criminal records reintegrate into life after incarceration. The North Carolina branch of the ACLU provides news and blogs on current events and local issues as well as information on how to get involved with local civil liberties cases. A statewide organization dedicated to providing free legal help to low-income citizens. This society has information on military legal assistance and military-specific legal programs, pro bono work, and lawyer referral programs in North Carolina. An organization for lawyers and legal professionals. It has information on publications, events, and further education as well as leadership and advocacy opportunities in North Carolina. A membership-based, not-for-profit organization that connects paralegals to provide continuing education and help with professional networking. This committee provides resources to minorities who serve in the legal profession in North Carolina. The NCDOJ serves the state by assisting with fighting crime in North Carolina and prosecuting cases. It also provides training and standards to law enforcement, enacts consumer protection standards and provides legal representation to state agencies. With information on the state highway patrol, capitol police, and bureau of investigations, this site has plenty of resources on the various law enforcement careers in North Carolina. This law enforcement and criminal justice training organization offers online as well as on-site trainings that range from basic training to specialized classes in areas such as narcoterrorism. A membership organization of law enforcement officers. They organize conferences and work to ensure North Carolina officers are well-trained and well-educated in criminal justice. This association’s mission is to strengthen the professional law enforcement services that North Carolina sheriffs provide. This group’s mission to support the betterment of criminal justice and provide advocacy for law enforcement officers in North Carolina. They also connect members and provide communication about legislation that affects officers in the state. An organization that connects and provides continuing education and ethics standards to private investigators in North Carolina. Information on how to pursue a career as a wildlife enforcement officer in North Carolina. This page provides resources on how to get in touch with the appropriate officials for different county wildlife offices. Protecting New England’s environment, the CLF uses law and science to market initiatives that protect Vermont’s natural resources. Learn more about how the CLF makes an impact and how to take action on this site. This local branch national organization hires employees to help protect North Carolina’s natural resources. The National Park Service employs rangers and other people interested in conserving national parks, and there are employment opportunities in the Blue Ridge and Great Smoky Mountains.